flask, so we charge a multiple of the basic, at our discretion. for polishing. Everybody uses it. the number of pieces on the sprue. Actual numbers we decide. To do this we need to make a second mould . 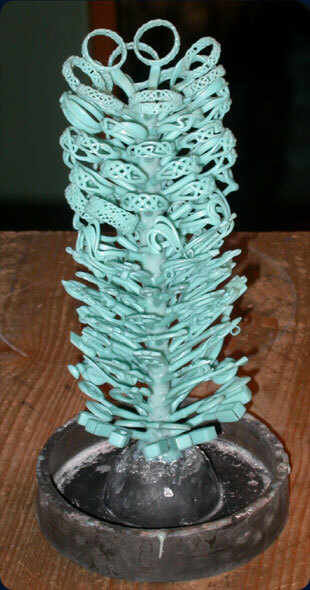 This multi-sprue is then treated as a one-off casting. We will send you a numbered scan of a wax from every mould we make for you, and your own moulds, for your reference. We also keep a copy for our own records. If you ever want your moulds back we will happily return them immediately at no cost apart from postage. Finishing: Need your pieces finishing? Ask us for a seriously reasonable quote. Perhaps not ones and twos but at volume we’re ideal. Finishing is mostly carried out by Barrel Polishing which gives a super shine to your pieces. We offer a Plating service in 9ct gold but, only if you are having your pieces finished. We also have Texturing facilities.